It's Theater Thursday & keeping with our CHRISTMAS theme I'm featuring Holiday In Handcuffs. Since it premiered on ABC family, I've had this movie in my holiday favorites. Holiday In Handcuffs starts Melissa Joan Hart as Trudie and Mario Lopez as Nick. On December 23rd Trudie is preparing to meet her family at a secluded cabin in the mountains for Christmas. All she has to do is get through her morning before her and her boyfriend make the drive. Her day does not go as planned. 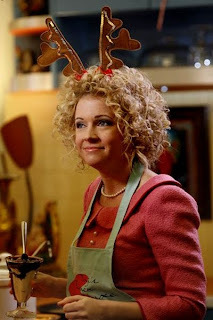 She has a job interview, a hair mishap and is forced to wear reindeer ears at her indian cuisine restaurant workplace. Then when her boyfriend shows up so they can depart, he gives her an unexpected and unpleasant surprise. This is where Nick becomes involved. Nick is meeting his girlfriend at the restaurant where he also plans to purpose marriage. Instead Trudie has different plans for his next few days. I love this movie because everyone goes a little crazy during the holiday season. Depending on how stressed I get, I could see myself (kinda) in Trudie's shoes. It's a must see! It's hilarious and charming and adorable all rolled into one. Promise me, you'll add it to your list this year! So random - this was on TV here yesterday! I love Melissa Joan Hart! I salute you and your love of Christmas! I looove melissa joan hart! I might just have to find this and watch it!